Dominica with its capital Roseau is located in North America (Caribbean, island between the Caribbean Sea and the North Atlantic Ocean). It covers some 752 square kilometers (slightly more than four times the size of Washington, DC) with 73,897 citizens. English is the language commonly spoken used by the people in Dominica. This country shares no land borders with another country. Dominica is a part of Central America and a Caribbean island between the Caribbean Sea and the North Atlantic Ocean. Visitors from the United States, Canada, Singapore and European Union nations are granted automatic visas on entry for up to 21 days. Other nations should check with Dominica immigration before traveling. As far as freedom of movement and exploration a car can be invaluable. Though small the island's tightly turning mountain roads make for relatively long journeys and a hair-raising experience. Driving is on the left hand side of the road. Dominica offers a trek through the rainforest on some of the best biking or hiking trails. Freshly squeezed grapefruit is ubiquitous and is perfect with every meal. Coconut water is cheap and readily available by the side of the road. Dominica is one of the safest places to travel in the region plus no poisonous snakes or insects. In the high lands and uninhabited central regions water is gathered at roadside springs. Public water is bacterially safe to drink due to heavy chlorination. The landscape is rugged mountains of volcanic origin. The average density of population is about 98 per km². The climate in Dominica can be described as tropicalmoderated by northeast trade winds, heavy rainfall. Potential threats by nature are destructive hurricanes can be expected during the late summer months, Dominica was the last island to be formed in the Caribbean some 26 million years ago, it lies in the middle of the volcanic island arc of the Lesser Antilles that extends from the island of Saba in the north to Grenada in the south; of the 16 volcanoes th and flash floods are a constant threat. To reach someone Dominica dial +1-767 prior to a number. The local cellular networks are operated on 850 MHz, 900 MHz, 1900 MHz, 3G, 4G. Websites typically end with the top level domain ".dm". If you want to bring electric appliances (e.g. battery chaarger), keep in min the local 230 V - 50 Hz (plugs: D, G). The sign for the locally used currency Dollar is XCD. 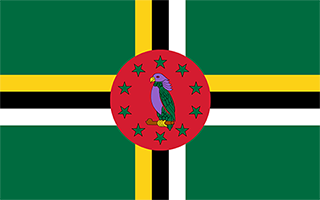 Green with a centered cross of three equal bands - the vertical part is yellow (hoist side), black, and white and the horizontal part is yellow (top), black, and white; superimposed in the center of the cross is a red disk bearing a Sisserou parrot, unique to Dominica, encircled by 10 green, five-pointed stars edged in yellow; the 10 stars represent the 10 administrative divisions (parishes); green symbolizes the island's lush vegetation; the triple-colored cross represents the Christian Trinity; the yellow color denotes sunshine, the main agricultural products (citrus and bananas), and the native Carib Indians; black is for the rich soil and the African heritage of most citizens; white signifies rivers, waterfalls, and the purity of aspirations; the red disc stands for social justice.